Are you ready to prove that you are a true ninja? Then join Leonardo, Raphael, Michaelangelo and Donatello and have a real ninja training with Master Splinter. Today the ninjas must learn some new moves which will be useful in their adventures, and you must help them in this free flash game. Do you like the amazing adventures of four brave ninja turtles – Leonardo, Raphael, Michaelangelo and Donatello as well as their sensei master Splinter? Then play this skill game online and have a real ninja training! 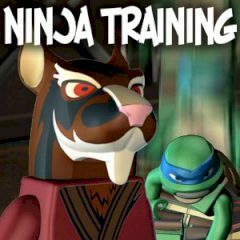 Splinter will show the ninjas some new moves which will be useful for them in their adventures. Your task is to listen to the Sensei and perform the actions he wants you to perform. Prepare to have much fun with this wonderful game which had been developed by LEGO Games.